NEW DELHI, APRIL 13: T. A. Pai Management Institute (TAPMI) held its 33rd Annual Convocation at KMC Greens, Manipal. S V Nathan, partner and Chief talent officer, Deloitte India and Dr. HS Bhallal, Pro-chancellor, MAHE graced the convocation ceremony. 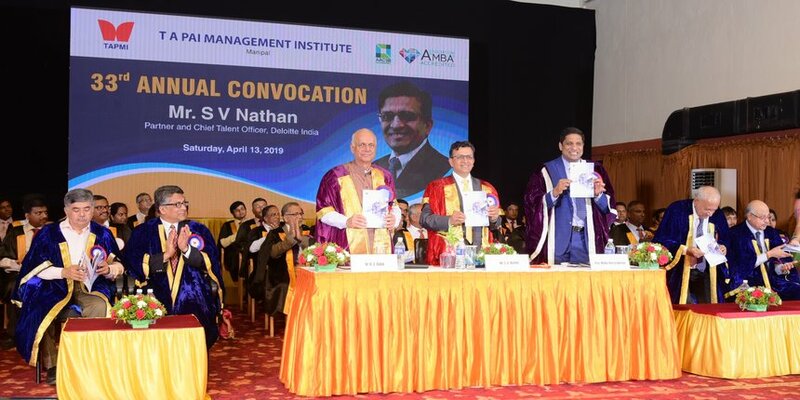 460 Students from the three PG Diploma streams, PGDM in Banking and Financial Service, Post Graduate Diploma in Management, and PGDM in Healthcare Management were witnessed graduating when Dr. HS Bhallal declared the convocation open. Prof Madhu Veeraraghavan, Director, TAPMI, while advising the graduating students stated: “The upcoming years will be very crucial as each of you will be posed with numerous challenges that will put you on a path to self-discovery.” he further stressed upon the TAPMI’s aim to produce industry relevant students who in next decade can take up leadership role in reputed organizations. At the 33rd Annual Convocation of TAPMI, Harpreet Singh was awarded the gold medal. Also, students from all the three streams were presented with scholarships and awards for their excellence and contribution in academic and co-curricular activities.